Since its release, a lot of people have come forward to share their opinions on the storytelling of Final Fantasy XV. Not surprising, given that Final Fantasy has long been home to story-focused, exposition-filled titles, and XV shakes things up considerably. It’s a story that left many feeling as if they hadn’t been told everything, turning to other fans to discuss the details and work out theories explaining the more mysterious parts of the game. “That’s not how a traditional story should be told!” many shout, but I came away with a different opinion. It’s no secret that the game’s tumultuous development cycle had an impact on the quality and quantity of sections of the game. However, while some of the ideas and characters that are introduced could absolutely stand to be fleshed out better — such as the character Verstael, who feels like a remnant of an earlier version of the story that they forgot to remove — I admired the way it took a storytelling approach that feels reminiscent of the Souls/Bloodborne games. Before we move any further, I know, comparing everything to the Souls games has been some of the most painful nonsense on the internet over the past few years, but its unique storytelling method is a perfect example for this scenario. It’s a method that is so uniquely tied to video games. In Souls games, you need to talk to characters multiple times, read item descriptions, and stop and look around at every new location. Without doing that, you’ll never fully understand what’s going on. Hell, even if you do all of those things, you’ll still need to stop and contemplate what you’ve experienced and compare it with others’ ideas. Final Fantasy XV doesn’t go as “all-in” on the historian approach to storytelling as From Software’s titles, but it uses ideas from the same school of thought to marry this approach to that of a more traditional video game. You’re given a real cast of characters rather than an avatar, more focused dialogue, and a more vibrant and lively world. This mix of styles affords FFXV the benefit of a muted storytelling approach without Souls’ reliance on item descriptions to explain information. Noctis is as ignorant to the world outside of Insomnia as your Souls avatar is to Lordran, but he has friends and a still populated world to give him the information that items would need to do in Souls titles. FFXV eases you into this idea by making the biggest chunk of the game a very traditional, open world experience. It’s a style of game that people go into expecting to have less story thrown at them at any one time. However, as you and your gang progress through to the more narratively driven segments, its story begins to home in on this muted approach. All of the pertinent information is there, but the game doesn’t piece it together for you, instead asking you to do that yourself. It asks you to take in the world around you — the little details that pass by, the conversations of strangers and pieces of news from radio broadcasts and newspapers — rather than explicitly telling you everything to your face. The train ride that kicks off Chapter 10 is an excellent indicator of this. There’s nothing to kill here, and there are no minigames for you to play. You just stroll along the train, listening to the passengers and reading bits of newspapers lying around. It’s a segment that simply asks you to think on the events of the previous chapter and wonder what will happen next. You continue to push through the latter chapters, naively expecting robust cutscenes to finally show up and tell you what’s been happening for the past 20+ hours, but the game has no interest in handing you everything on a platter. Even upon finishing the game, some parts of the lore are left to interpretation, and some require you to sit and really think about what you’ve experienced. This is something that Chapter 13 really hammers home. You arrive to the empire expecting an imposing city housing an army of terrifying power that you’ll need to somehow fight your way through, only to find that someone has beaten you to the punch. Not just “someone” though, one person, and the person your characters would least expect to have taken such action. 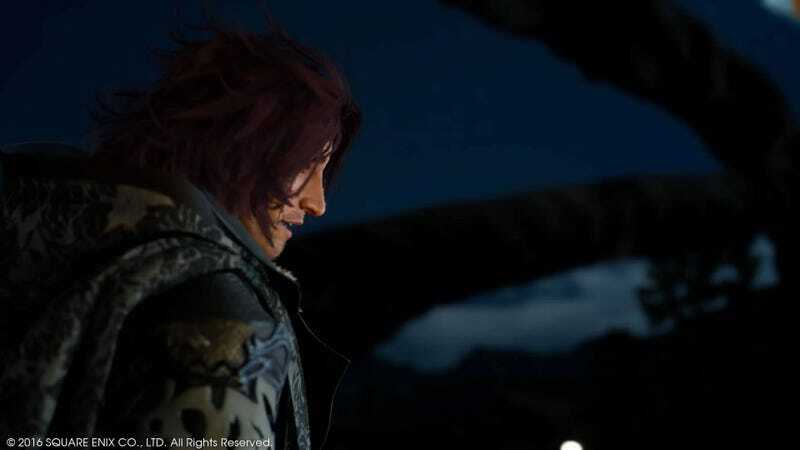 You piece together what happened there through Ardyn’s taunting, through seeing the scenery and the remains, and through the research notes of those who were studying the village that disappeared and eventually began researching magitek. You see the Emperor’s robes sitting unoccupied on his throne with your own eyes, as if his body had simply evaporated. You then battle a fierce demon later in the level, one who had been a source of frustration throughout the level itself, and his strangely human cries reveal his true identity. It’s in moments like these that Final Fantasy XV’s storytelling pays off in dividends for me. You’re presented with all of the information that you need to understand what has happened, and the moment all of those pieces click together in your mind you’re left with this fantastic “aha!” moment. It’s a feeling that those who find delight in the stories of Souls games are very familiar with, and no part of FFXV is more reminiscent of those games than the infamous Chapter 13 itself. It’s not just Chapter 13 though; this game’s story constantly sees Noct arriving in locations after big moments have already taken place, leaving him to piece together for himself what happened. This isn’t intended to be just a blind defense of the title though, and I hope it doesn’t come off as such. I don’t begrudge anyone for wanting or expecting a more traditionally told story, nor do I wish to hide away its lacking elements or the parts where you can see that this team simply didn’t have the time it needed. I only want to present you with a different perspective from which to view the story we were given. There are absolutely parts of this approach that could have been executed better. The formerly mentioned Verstael is one example, and even Tabata has expressed interest in expanding on Ravus’ story. It would be naive to pretend that Square as a company had no doubt placed tremendous pressure on Tabata and his team to turn years and years of vaporware into a highly selling, coherent title as quickly as possible. This not a game that was made over the course of 10 years; this is a game that had to take 7 years of half-baked ideas and make something of them in 3. Tabata and his team have promised to continue updating and expanding on Final Fantasy XV, and I am excited to see what comes of that. I genuinely wish we could have seen his vision for this game brought to life fully. It would have been so easy for the game to have been the usual exposition-filled story that Final Fantasy is accustomed to, and yet I can’t help but admire the approach they took in the end.